I don’t know about you, but I like my Hercules to look really beefy and have a well-groomed beard. I’m not into a budget Hercules who is quite hairless, only has moderately sized pecs and gazes wistfully at llamas. If you’re wondering how it is that Hercules is even on the same continent as a llama, you don’t know much about the ancient world. 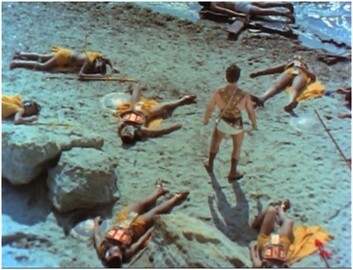 Hercules (Mark Forest) and his buddies angered the gods (probably Neptune according to Hercules) and of course had their asses shipwrecked in South America! Hercules was the only survivor, which makes sense since he was a demi-god and he quickly forgets his anguish over his dead buddies once Prince Maytha shows up and becomes his new best friend. 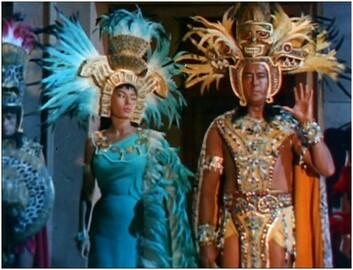 Hercules is soon attacked by the soldiers of the evil king Ata Hualpa who, as they would constantly tell us, had usurped (they used that word more times in this movie than I have heard previously in my entire life) the throne from the rightful king, who just happens to be Prince Maytha’s father. Prince Maytha is living in exile while the evil king has his father and sister, Yamara, prisoner. He intends to sacrifice Yamara to the Sun God, explaining that the more noble or royal the blood, the more the god will be appeased. After being victorious in an incredibly lame test of strength against a guy with a lazy eye, Hercules tells Maytha he and some of the men will go rescue Yamara. One of the guys says that they’ll just take the secret passage to the city, which I thought was convenient and might make a good way to attack and kill the evil king, but then I’m no Inca warlord, am I? It is an arduous journey over a rickety bridge and we have to watch Hercules grunt and strain to move another rock, which pretty much bounces once he moves it. Then they lurk around in the place where the big sacrifice was going to be held. Unfortunately for us, Hercules is one of those guys who waits around to pick his spot. This means we have to sit through the entire pre-game show, which involves archers dancing and leaping around in outfits adorned with gigantic blue feathered headdresses that I could have sworn I’ve seen Cher wear whenever she’s on tour. After these goofs get done dancing Hercules shows up and rescues Yamara. Lots of poorly choreographed fighting ensues with people getting stabbed, shot with arrows, and generally falling down an awful lot. When they finally get back to Maytha’s village, Yamara falls in love with Hercules, but their love affair is marked by Hercules’ strange obsession with llamas. Director Osvaldo Civirani (Kindar the Invulnerable) tells us more about our demi-god than he probably meant to when he has Yamara and Hercules kiss and instead of cutting to missiles launching, volcanoes erupting, or a train going into a tunnel, he cuts to a shot of stampeding llamas! Then, just to drive the point home, after Herc and Yamara make out a little more, they cut to the next day (the morning after, as it were) and Hercules is standing at the llama pen staring at the animals with that twinkle in his eye! To honor Hercules, Maytha has a big festival for him and this is where you get about five solid minutes of hideously boring native dancing. The reaction shots of Hercules were obviously filmed at different times than the festival was and you had the feeling that Civirani was just using footage of Mark Forest standing around on the set looking for the catering truck or something. Once it’s finally done, they get down to business and decide that they need to attack the evil king and maybe even rescue Maytha’s dad. Hercules says that he’d like to introduce the Incas to a little thing he likes to call the wheel and so it happened that the wheel was introduced to the New World! They build some “war machines” and roll them up to the walls of the city and start their big fight. What follows is a pretty bad melee with people clutching arrows unconvincingly and stumbling around before finally falling and dying. I even saw a guy weakly throw a spear that barely made it over the wall he was standing on! 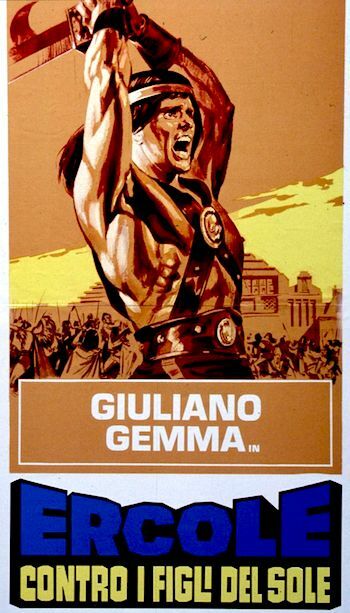 A movie that is pretty funny in spots, but any enthusiasm is dampened by the lengthy dance sequences and how few feats of strength Hercules performs (he lifts two rocks and pushes one column). Mark Forest (Son of Samson, Goliath and the Sins of Bablyon) isn’t a very charismatic Hercules, emanating none of the hairy personality of Steve Reeves or even a Reg Park. Forest’s chief acting trait appears to be standing around and grinning dumbly. The dubbing is predictably bad, with stern sounding guys providing all the voices without even any accents to try and make it sound authentic. The dialogue is as stiff as Mark’s acting and things suffer from the lack of any great monsters or tasks for Hercules to get busy with. Still, it’s a nice change of pace to have a bad Hercules movie set in South America instead of a bad Hercules movie set in Asia or Europe.